Relive your favorite science fiction movie at your wedding with Star Wars movie quotes transformed into your vows. Select scenes with characters that most resemble your relationship and select passages from their dialogue for your wedding vows. For years, brides have insisted on having the perfect fairytale weddings, complete with puffy gowns and grooms in elaborate tuxedos. 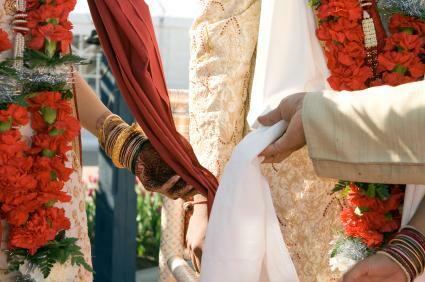 Today it is becoming more common to see grooms insisting on weddings that better suit their preferences. Science fiction theme weddings are among the top requested. If you have decided on a Star Wars wedding, you will need vows that bring a sense of fun and some movie authenticity to your ceremony beyond your choice of Star Wars costumes for attire. In the Star Wars action-adventure movie series, two couples play the leading roles around which smaller story lines evolve. In the first three movies, Jedi Anakin Skywalker and Queen Padme Amidala play the romantic leads. In the last three movies, the romantic focus is on rogue mercenary Han Solo and Princess Leia Organa. Take inspiration from these two couples, each of whom faced unique challenges with very different endings. Work in Star Wars wedding quotes from the movies where you can, too. This couple faced serious challenges. Anakin was seduced by the Dark Side after having visions of Padme's death. Padme did indeed die later bearing the couple's twins, Luke and Leia. Consider these Star Wars wedding vows that reflect these characters' love for one another. My Queen, may the Force be with us as we travel through the galaxy of life. I pledge to never turn to the Dark Side but stand forever in the illumination of our love. I vow to fight the Evil Emperor and I invite you take your place at my side as we rule the galaxy. Take my hand and stand with me for light and justice throughout our lives. My Jedi, my love, I take your hand and accept your pledge. May the force be strong with us all the days of our lives. There is good in you, I sense it. Remain a Jedi and I will stand by you. I pledge to you my love and my companionship as long as I live. Han and Leia overcame carbon freezing and Han's roguish attitude before finding happiness together. Use these vows for a Han and Leia themed wedding. Princess, I love you more than I love the Millennium Falcon. I'll give up a lifetime riding the galaxies in search of treasure with Chewie just to be with you. Together we can withstand anything, even the Death Star, Jabba the Hut and Darth Vader. Come with me and we will make this world and the others around it ours. I'll take part in any rebellion you want and pledge my life and love to you, Princess. Han, no matter what world we crash land on, I know that you will take good care of us. No matter what happened in the past, I know you are brave, intelligent and I love you. Together we can stand against injustice wherever we find it and bring freedom to our world. The Star Wars vows you recite do not have to be based on characters from the movies. Instead, consider writing original wedding vows that reflect the general spirit of the Star Wars movies. These vows should focus on loyalty, friendship and love, no matter where your lives take you. On your wedding take your friends and family to a galaxy far, far away with inspired wedding vows.